Hope you all are having a lovely day. I was recently given the chance to trial some Alison Claire Shampoo and conditioner* samples. Alison Claire Natural Beauty stocks natural products which include organic skin care and shampoos. They came in a lovely bag and the sample sizes were a great size. I've finished both of these completely now with means it's review time! I've been trying out the Lemon shampoo and conditioner which is for oily hair types. I am certainly an oily hair type. My roots start to get oily on the third day of washing my hair sometimes even the second. My hair as I have mentioned previously is long and thick so considering that I've used these sample about 5 times I think. 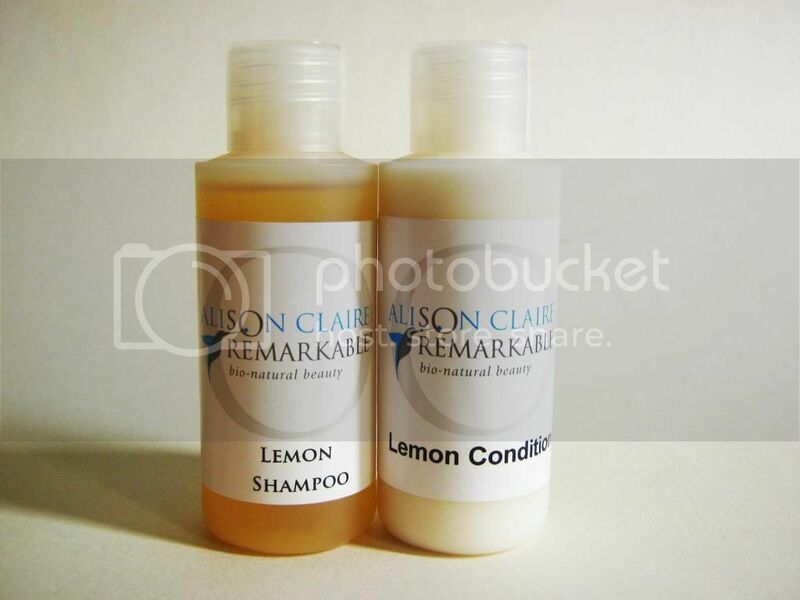 The Lemon Shampoo (£12) - The full size bottle is of 200ml. This shampoo smells really nice. Very zesty and fresh. It's not too strong but subtle. A lot of the times lemon based shampoos can make your scalp very dry because it tackles the oils but this one doesn't make my scalp dry. It stills controls the oil and make my hair appear less oily at the roots but doesn't give that 'squeaky clean' feel which I think is terrible! Makes my hair feel light and clean which is what I look for in a shampoo. It also gets rid of any build up that may be present, again because of the lemon. The only thing that I didn't like was that I found it hard to lather it up. I had to add alot of water into it to make it 'foamy' as without that my hair stays how it was. But I know when shampoos are organic and natural they don't lather up which is indeed a good thing. The Lemon Conditioner (£12) - This also comes in a 200ml bottle. I really loved this conditioner. It made my hair soft and silky. It also helped it to appear less frizzy as it almost tamed it. The lemon fragrance is quite energetic and fresh just like shampoo. It made my hair easier to brush out too because I usually have tangled hair after washing it. It's a nice product if you want manageable and soft hair! You can check out these two products over at Alison Claire. Have you tried any lemon based hair products? It's really hard to find a good organic shampoo for oily scalp. All those that I'v used left my hair unclean and they smelt absolutely horrible! These sound like they are heaven sent. I know what you mean about it feeling weird when the shampoo doesn't lather up; I always think that my hair feels dirty after, regardless of how clean it actually is lol. I keep seeing posts about this set it sounds amazing, I love the smell of lemon. I would definitely try it! I was intrigued by Lemon as a main ingredient in the shampoo but got quickly put off as you mentioned it doesn't leave hair squeaky clean and doesn't lather nicely. i do like ones that lather richly!! I learned about 2 new products today , thanks for sharing . With today's mass commercial products that feature an overwhelming amount of chemicals that are toxic for the body, it's wonderful to see people who advocate for natural solutions to promote health. I have also embraced a more natural lifestyle by using a Natural Shampoo that leaves my hair healthy, radiant, and beautiful without the excess toxins. I have never tried the lemon product, though. I heard lemons are great for your skin and hair, I will definitely be giving this a try! Thanks! Is lemon is good for hair? because I never use any lemon flavour products. If it is good obviously I can try this from my hair and consider as best hair conditioners. Please leave a comment and make my day! All content copyright to Iheartmexo unless stated otherwise.. Theme images by merrymoonmary. Powered by Blogger.